There are only a handful of recipes that make up part of who I am as an individual. Coq au Vin is one of them. I first had the dish is Paris in 1992, but was unable to replicate its rich sauce upon my return home to San Francisco. It took me 20 years of trial and error (and the invention of the internet) for me to even come close. Coq au Vin taught me the important lessons of patience and perseverance in my 20’s. My life would have been different had I chosen a different item for that 1992 Parisian menu. Last night, I made my best Coq au Vin yet. 4-1/2 stars. A few minor tweaks will easily bring this up to a full 5-stars. Delicious and worth the 3+ hours. The secret to delicious Coq au Vin is patience. It takes over 3 hours, and even after removing the fully-cooked chicken, it still requires reducing the sauce as much as 50 minutes. In Step 10, take the time to measure out the sauce to ensure you’ve reduced it far enough. After 35 minutes, I still had nearly 4 cups of sauce (see photo at bottom of post), though I was expecting only 2 cups. I recommend using salt pork. I modified the recipe below so I will use it next time. Last night I used thick-cut bacon, but the smokey flavor of the bacon doesn’t integrate completely into this recipe. 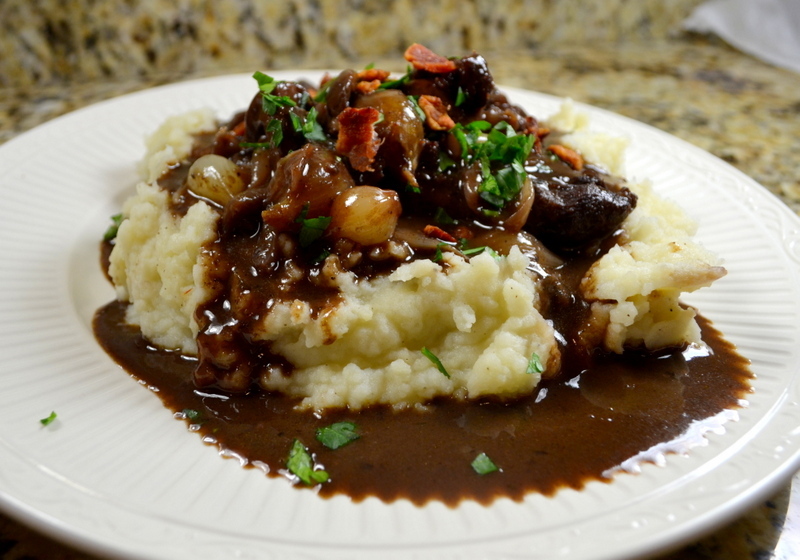 This recipe is more typically usually accompanied only by parsley potatoes. I served them with mashed potatoes today. Chris Kimball says to use 24 frozen pearl onions, and to thaw, drained, and pat them dry with a paper towel. In the past I have been unable to find frozen pearl onion, except sold in a disgusting pre-made cream sauce. I did try the cream sauced variety (from Birds-Eye) once, but will never use them again. Today, I did see that Birds-Eye also sells a larger bag of un-sauced, frozen pearl onions. I used my fresh boiler onions. Chris Kimball recipe doesn’t call for any brandy, but I added some based upon Julia Child’s recipe. She adds and flames the Cognac just after browning the chicken, but I did it after softening the mushrooms, because of the 1/2 cup of chicken fat that I removed in Step 5. Start time: 3:00 PM. Dinner time: 6:20 PM. 2 pounds russet potatoes (for mashed potatoes) or small new potatoes (for parsley potatoes). Remove the rind and cut the salt pork into lardons; 1/4″ x 1″ match sticks. Cook the salt pork in a dutch oven for 10 minutes over medium heat until browned, using a spatter screen if you have one (which you will also use for the chicken). Remove salt pork to paper towels and pat to remove any excess grease. Set aside until ready to serve. If your chicken is not yet prepared as part of Step 2, then remove pot from heat. Meanwhile while the bacon is cooking, prepare your chicken by trimming away any excess fat. Dry the chicken using paper towels and season both sides with salt and pepper. If you have less than 2 tablespoons of pork fat, add vegetable oil. Cook the chicken in two batches over medium-high heat, cooking for 8 minutes per side (a total of 32 minutes). Again, use a splatter screen if you have one, because the spattering chicken makes a big mess. After each batch is complete remove to a plate and set aside. While the chicken cooks prepare pearl onions and quarter mushrooms. If using fresh pearl onions, roll the onions between your hands to remove as much of the papery exterior as possible, then slice off root ends. Add the onions to boiling water for 1 minute, empty to a strainer then shock in an ice water bath. This will help you remove any remaining outer skin. Remove all but 1 tablespoon fat from the pan (I removed 1/2 cup of extra fat), and cook the quartered mushrooms and pearl onions over medium burner for 10 minutes. Pour brandy into pot and light it on fire with a long match or BBQ lighter. Swirl the pan and let the flames go for about a minute until they start to burn out naturally. Press garlic cloves directly into pot and add 1 tablespoon tomato paste. Cook for 30 seconds, then add flour and cook for 1 additional minute. Add wine, chicken broth and deglaze the bottom of the pot. Add thyme, bay leaves add 1/4 teaspoon pepper. Return the chicken to the pot, nestling the pieces so that they are submerged. Cover pot and cook chicken over medium-low burner for 45 minutes, maintaining a slight simmer; until chicken reaches correct internal temperature; 175 for dark meat. Use a slotted spoon to remove the chicken when done, placing in a large bowl and tent with aluminum foil to keep warm. While the chicken cooks, put a large pot of salted water on the stove-top and begin heating for your mashed potatoes. 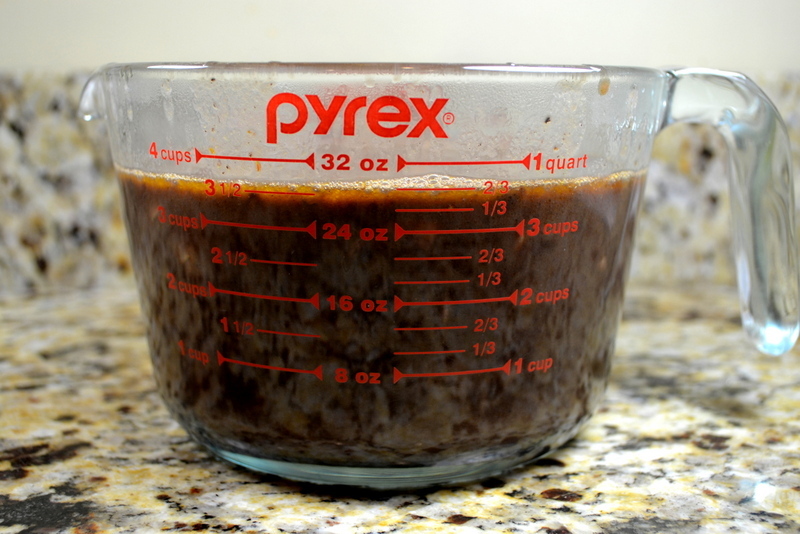 Reduce sauce, uncovered, for between 35 and 50 minutes until the sauce has reduce to about 2 cups and is thick. Replace the chicken in the pot for last 5 minutes to reheat. Remove pot from heat and put chicken on serving platter. Fish out the 2 bay leaves, whisk in the butter and adjust salt and pepper according to your taste. Pour sauce over chicken and spring with pork and parsley. After 35 minutes I still had nearly 4 cups; keep reducing! 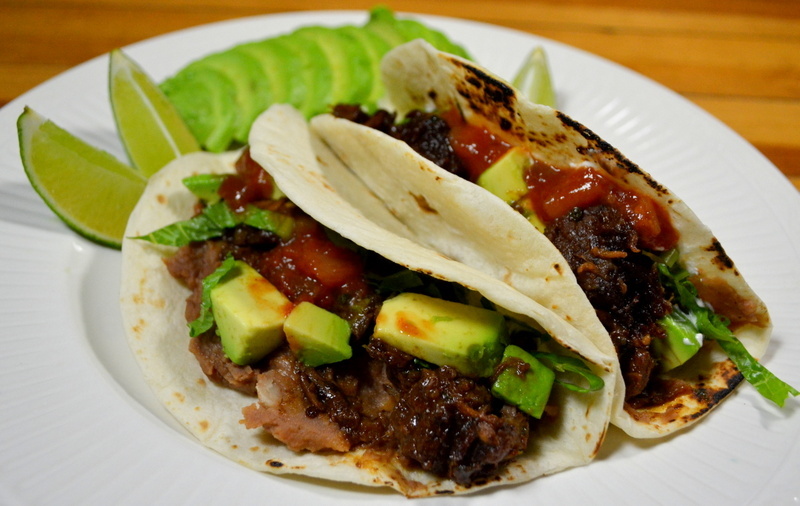 I have been making simple steak tacos for a few years, and wanted to update you with the progress I’ve made on my recipe over the past few months. Chris Kimball doesn’t have much in the way of similar recipes. While they only take about 20 minutes of effort, they do take just over 2 hours to make. So far, it’s 4-star, but this particular batch came out closer to 4-1/2 stars, because of the refried beans and extra-slow cooking of the steak (This batch took an extra 30 minutes for the chicken broth to evaporate). I love shredded steak tacos, but they take longer and it’s impossible to make them on a weekday. This recipe will yield tender, but not necessarily shred-able. My kids love ground beef tacos, a la Taco bell, and I do make homemade ground beef tacos occasionally for a quick weekday meal. But on days that I also eat dinner (I usually don’t eat dinner during on weekday), these make a much better alternative but will take at least an hour longer to make. If you have a little refried beans then apply a thin layer to tortilla before assembling your tacos. Of course we all know Mexican food is not one of Chris Kimball’s strengths. His only recipe is for medium-rare flank steak instead of slow-cooked chuck. 1-1/2 to 2 pounds Chuck steak, about 3/4″ thick. Garnish with your choice of: chopped tomatoes, shredded lettuce, grated Monterrey jack cheese, salsa, sour cream, diced avocado (or guacamole) and lime wedge. Separate steak along its natural fat lines, then cut up into 3/4″ cubes. Pat the cubes dry and season with 1/2 teaspoon table salt. Pre-heat 2 teaspoon vegetable oil in a Dutch oven until just smoking, then brown beef on all sides in two batches; about 8 minutes per batch. Set cooked beef aside on a large plate. Repeat this step with the second batch of beef using 1 additional teaspoon of oil. Meanwhile dice onion and peel garlic cloves. Also begin to pre-heat the oven to 350-degree. Add 1 teaspoon vegetable oil to the now empty Dutch Oven and saute diced onion together with 1/2 teaspoon salt for 5 minutes, using the moisture of the onion to scrape up the fond from the bottom of the pan. After the onion has softened add the cumin, coriander, cayenne and chili powder and saute for 1 minutes. Press garlic directly into Dutch oven and saute for 30 seconds. Add the chicken broth and cider vinegar, and use the moisture to deglaze the pan. Add the meat back to Dutch oven, and bring up to a simmer. Transfer to your 350-degree oven for 1-1/2 hours. Cook, uncovered, until meat is very tender, stirring beef half way through. Mix in chopped cilantro after your beef is done cooking. Prepare your corn tortillas my placing directly over the flame of a medium burner (without any pan), until warmed and very slightly charred. Serving with your choice of toppings. When I made my tamales earlier this week, I wanted to spice them up a bit so made this delicious tomatillo sauce to accompany them. Tomatillos are the basis of most green, Mexican sauces. The sauce itself only takes a few minutes for work to put together, and is definitely nicer that store-bought salsa. If you cannot find fresh tomatillos, Chris Kimball says it is OK to use two 13-oz cans of drained tomatillos. The hardest part of this recipe may be to find the tomatillos. 4-stars. Start time 5:20 PM. Dinner time 6:00 PM. Remove the husks and wash your tomatillos, and remove the stem from your jalapeno. Add whole jalapeno and tomatillos to a small pan over and add enough water to cover. Set pan over high heat and bring up to a boil. Once boiling, reduce to a simmer and cook for 10 minutes. Use a slotted spoon to remove the tomatillos and jalapeno and allow to cool for 5 minutes. Meanwhile, peel and roughly chop your garlic. Coursely chop cilantro and onion. If you want a milder sauce then you can remove the seeds from your chile. 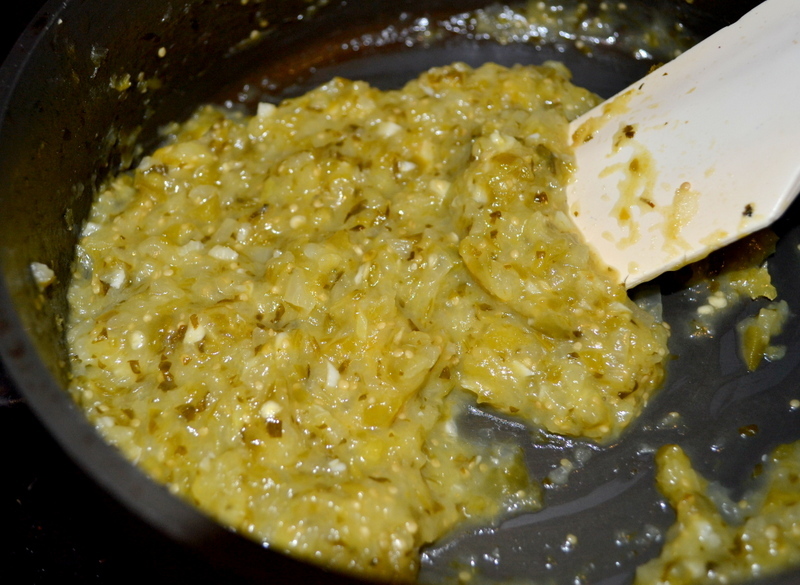 Add tomatillos, jalapeno, cilantro, onion, and garlic to food processor, and process until reaches a coarse puree. Pre-heat oil (or lard) in a medium skillet over medium-high burner, and cook puree for 5 minutes until it thickens, stirring constantly. Add stock and bring up to a boil, reduce burner to simmer for 10 to 15 minutes until the sauce is thick enough to lightly cover the back of a spoon. Add salt according to taste. Serve warm. I celebrated Epiphany; January 6th, the day when the Three Wise Men visited baby Jesus; at the home of my son’s Mexican Godparents. In Mexico it is commemorated by eating Rosca de Reyes and searching for the hidden muñecitos (little baby Jesus dolls) within the cake. According to tradition, anyone who finds the tiny dolls hidden in their cake slice must make a Tamale dinner on February 2nd. In a slight variation of the Mexican tradition, this was my third year making and delivering Christmas tamales on the Twelfth Day of Christmas. With the basic technique solved in my two prior tamale-making attempts (see here and here), this year I concentrated on improving my lackluster dough. To boost the corn flavor, I took a hint from Chris Kimball and added: (1) one pound of frozen corn, (2) 1-1/2 cups of quick grits (not instant grits) that were softened in 2 cups of chicken broth. I also added some raisins and a little bit of baking powder. To the shredded pork, I added a little shredded Monterrey jack cheese. Any to top of my dinner, I made some homemade tomatillo sauce. The results were great; 4-1/2 stars. The dough had much better corn flavor, and the extra liquid I added to the dough (a total of 9 cups of broth) kept the finished tamales moist (prior years were too dry). 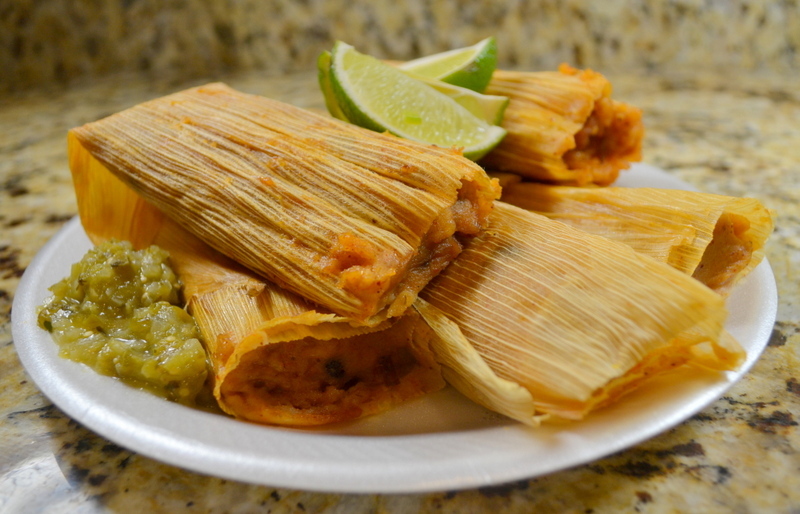 Pork tamales take at least 6 hours to make, but can be started the day before if you need time to make them after work. Because I don’t have a steamer basket, I made my own out of coke cans cut to half-height and a flattened disposable aluminum pan with steam holes poked all over. I used bamboo skewers to support the flattened disposable pan so that it wouldn’t collapse under the weight of the tamales. This year I used more meat in each tamale, so didn’t have any leftovers to make tostadas. Next year I will try to use a bigger roast, and adjust the paste recipe so as not to dilute the great flavor of the pork. Cost: $17 for 3 dozen. Start time 12:00 PM. Dinner time 6:00 PM. Six hours before dinner, take your dried corn husks out of the package and put them in a large Pyrex casserole dish filled with hot tap water. This will soften them so they are pliable enough to be easily folded. Put dinner plates of top to submerge the husks and soak for 3 hours. Remove corn from freezer and allow to thaw. Meanwhile, cut pork roast into large fist-sized chunks (along the lines of fat, where possible). Fill a large pot with 9 cups of water, adding the other ingredients listed under the Tamale Filling. Boil for 2 to 2-1/2 hours until meat is tender. Remove the pork and allow to cool in medium/large mixing bowl for 10 minutes, straining and reserving the pork broth for later in Step 6. Use two forks to shred the pork, after about 10 more minutes the pork will become cool enough to finish shredding with your fingers. Discard any excess fat or unappetizing bits. Cover the bowl with plastic wrap to prevent the meat from drying out. While pork cooks, mix the paste ingredients together in a small bowl, and add to the shredded pork. Add 8 ounces of shredded Monterrey jack cheese. Mix until incorporated, and allow to marinade until ready to assemble the tamales. Bring 2 cups of chicken broth to a boil, remove from heat and add grits. Allow to soften for 10 minutes. Empty softened grits and corn into food processor and pulse until smooth. In a separate large bowl, add grits, 7 cups masa flour and all spices and raisins. Use a wooden spoon to mix. Add 2-1/4 cups of corn oil (or vegetable shortening) to masa and 7 cups pork broth (1 cup at a time), mixing well after every cup. It should be the consistency of peanut butter. Lay the husk flat and spread about 3-1/4 oz masa in a rectangle in the center of the husk to about 1/4″ thickness. Put as much shredded pork in the middle of the masa will fit; for better flavor. Push filling flat and work dough into a cylindrical shape, with the dough on the outside and the filling is on the inside. Fold and roll your tamale, and place in steamer basket so that gravity will hold the seam closed. See some helpful hints on rolling below. Fill the pot with water; being careful that the water level is below the bottom of steamer basket. I used a colander fitted inside my Dutch oven, and also use crumbled foil as “feet” to elevate your collapsible steamer. Cover your steamer and bring the water up to a boil. Then turn down the heat down (but maintaining a boil) and steam for about 2 hours. Check the water level and add approximately 1 cups water every 30 minutes, so that the pot doesn’t boil dry. The tamales will be done when the masa is firm and easily pulls away from the husks, also try tasting a bit of the masa. Preparation time is 6 hours. Makes 36 tamales, and use the remaining filling to make tostadas. 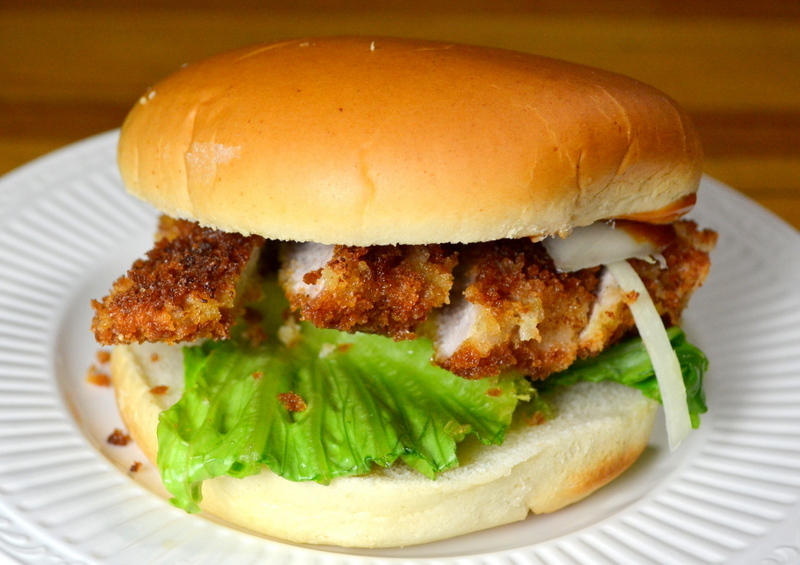 Tonkatsu is often served on a plate with shredded cabbage, but I made these today as sandwiches. 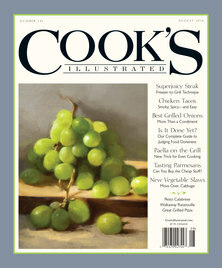 Chris Kimball’s recipe using a familiar assembly-line technique of 3 pie plates, but he uses cornstarch instead of typical flour. While my two sons loved the recipe, rating it 4-1/2 stars, it seems to me that Cook’s Illustrated specifically designed this recipe to make the biggest possible mess in my kitchen in the shortest amount of time. While good, I didn’t think it was sufficiently special to justify the huge mess. So I only rate it 3-stars. My supermarket was only selling boneless, center-cut, pork loin chops in 8-packs for $14. Instead, I bought the bone-in variety for $6, and de-boned the chops myself, which only took a few minutes. My bone-in chops included both the loin and tenderloin muscles, but because Chris Kimball had a variation of this recipe using the tenderloin I used the meat from both muscles. Whereas I pounded the loin muscle to 3/8″, I left the tenderloin at 1/2″ thickness. I bought the bone-in chops based upon cost, so wanted to give you a breakdown for a cost comparison. The weight of the bone-in chops breaks down as follows: 50% boneless loin, 20% tenderloin, 30% bones/other waste. The boneless chops were $4.29/lb, where the bone-in were $1.99/lb. If I were to have only used the loin, my meat would have been $4.06/lb. Using both loin and tenderloin my meat cost me $2.98/lb. The original recipe calls for 3 cups of Panko, but I reduced the recipe below for two reasons. Firstly, 3-cups of bread crumbs do not fit in a pie plate, so the bread crumbs spilled onto my counter-top as I tried to cover the chops in step 5. Secondly, didn’t use anything close to 3-cups of panko. The original sauce recipe was double that which I’ve shown below. The reduced amount that I give should more closely correspond to how much you will actually use today. The $10 price tag includes hamburger buns. Actually, I bough some beautiful, super-size buns (24-ounces per 8-pack instead of the typical 12-ounces). Without the buns, the recipe would cost $8.50. Start time 5:15 PM. Dinner time 6:00 PM. 6 boneless, center-cut pork loin chops. Set a rack to the lower/middle of your oven and pre-heat oven to 200-degrees. Set a large heat-proof plate (such as Pyrex casserole dish) in your oven. Prepare 3 pie plates as follows: (Plate 1) 1/3-cup cornstarch, (Plate 2) 2 eggs and 1 tablespoon vegetable oil, mixed together. (Plate 3) 2-cups panko breadcrumbs. Trim away and discard the silver skin and fat from your pork. Use a meat pounder until your pork an even 3/8″-inch thickness (but leave any tenderloin at 1/2″ thickness. Pat your pork dry using paper towels and season with salt and pepper. Working with one chop at a time, dredge in cornstarch and shake off any excess. Use tongs to dip both sides in egg mixture, and allow any excess to drip away. Cover both sides of chops in panko, using your fingers to press and ensuring an even coating. Set breaded chops onto a wire rack set over a rimmed backing sheet, and allow coating to dry for 5 minutes. Add 1/2-cup vegetable oil to a 12″ non-stick skillet and set over medium-high burner. Pre-heat for 2-1/2 minutes until oil is shimmering (but not yet smoking). Fry 3 chops for 2-1/2 minutes per side until nicely browned, using a wide metal spatula to press down ensuring even browning. Use a splatter screen if you have one to avoid a big mess on your stovetop. Use tongs to flip to the chop and fry the second side of another 2-1/2 minutes per side until nicely browned. Line the plate in the oven with paper towels, and put the chops in the 200-degree oven while preparing the second batch. While the chops cook, prepare your sauce as described below. Discard the oil in the skillet and use a wad of paper towels to wipe skillet. Repeat step 5 with the remaining pork, but only pre-heat the oil for 2 minutes. Slice into 3/4″ wide strips and drizzle with Tonkatsu sauce. In a small bowl, mix mustard powder and water. You are currently browsing the My Year Cooking with Chris Kimball blog archives for January, 2014.